Are you the type who loves squeaky clean toilets which are smart and environmentally-friendly? Japan is notorious for its obsession with toilets and has notably come up with toilets which can warm, wash, blow dry and deodorize the bum. 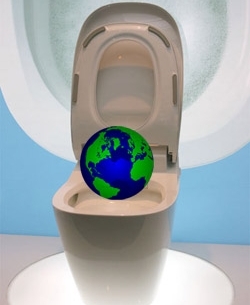 Unfortunately, these toilets consume energy like there’s no tomorrow and Japanese are paying through their noses to support their obsessive toilet craze. Toto has come up with a solution to this plight. The super-deluxe awesome toilet, Toto, is the latest toilet technology which cuts energy consumption by half. It is smart and knows everybody’s pooping time and warms up only just before someone uses it. Thus, one can get pampered in the toilet without feeling guilty for harming the environment. Unfortunately, if one has diarrhea or if the body decides to dispense off its wastes at a different time that day, the toilet may not heat up in time for one to clean one’s bum with warm water.